Today's recipe proved to be a little bit of an adventure! As I've said before, I tend to be hesitant when it comes to making up recipes on my own. Perhaps it is because I am not a trained chef - am I knowledgable to put random ingredients together and call it a blog worthy meal? Or perhaps it is simply because I do not try it enough. Afterall, practice makes perfect, right? 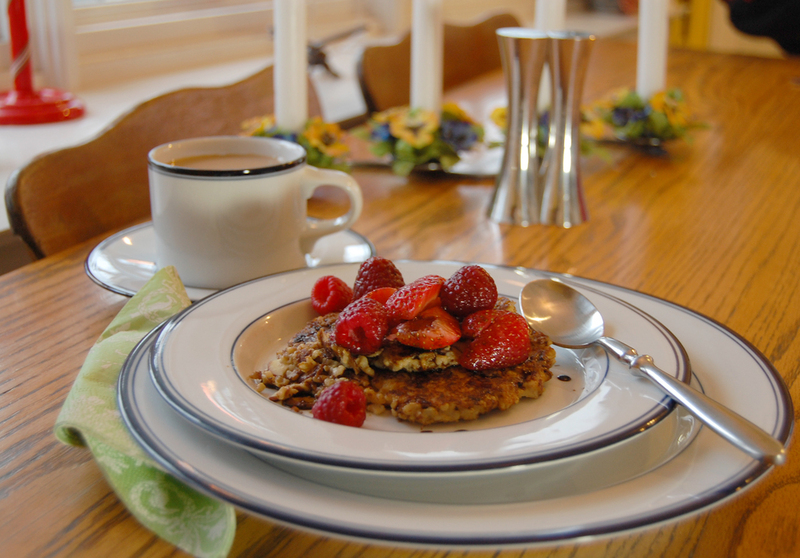 So, it is with that mind frame that I went into creating the recipe for Steel-Cut Oatmeal Cakes with Berries and a Balsamic Vinegar Reduction. I had a general idea of what I wanted to do, but soon found out that I would have to improvise as I cooked! If I am ever going to win Top Chef, I HAVE to start taking chances and coming up with things on my own. This doesn't mean I will quit reading my food blogs, no way! But it is time that I start taking inspiration for my own recipes. I initially tried frying to oatmeal as is, but quickly found out that there needed more substance to help the cakes hold their shape while frying. Hello molasses, sliced almonds, overnight refrigeration, and finally egg! The steel-cut oatmeal should be prepared the night before! Calm down. Don't be afraid to try things out. If they don't taste good, don't do it again! You will never learn what combinations of ingredients taste good together unless you try! So jump right in and TRY! Cook steel-cut oats, according to packaging. Mix cooked oats with molasses and sliced almonds. Refrigerate overnight. Toss strawberries and raspberries with 3 tablespoons orange juice, set aside. Heat aged balsamic vinegar in a small saucepan over medium-low heat until thick, about 15 minutes. Stir occasionally. Watch carefully to make sure vinegar doesn't burn. Set aside to cool. Remove oatmeal from the refrigerator and mix with egg. Scoop oatmeal onto skillet, forming small cakes. Cook on each side until browned. Scoop mixed berries onto the oatmeal cakes and drizzle on balsamic vinegar reduction.